The tsunami for real estate syndication is coming! Off Market investing is a process that requires careful analysis and direct access to information about off-market deals. The time to invest in off-market commercial real estate is now. If the economy continues to improve as we expect in America, some people are going to make a lot of money in real estate. So how can you participate in this asset class over the next few years? Well, you can invest in funds that work with Open Source Capital. Invest in assets that you can touch, along with the people and the strategy of knowing where your money is being invested. Commercial real estate investing might prove to be even better than stock and bonds over the next decade. We specialize in being a “boots on the ground” resource for real estate funds looking for off-market real estate deals. For many wealthy people, off-market real estate investments represent a sizable portion of their net worth. We believe these assets deserve the same kind of attention that is given to financial investments, such as stocks and bonds. We have a long history of working with Real Estate Developers and Real Estate Funds to help them locate, finance, develop, and manage real estate. As such, we form long-term relationships with an assortment of developers, private equity groups, and lenders nationwide. Our professional Sponsors are located around the country. They understand the local market, which is critical because real estate values are very much influenced by local factors. On our website, we explain the nuts and bolts of how Regulation D 506c works, and how real estate funds work with us to find and fund real estate development projects. We, in turn, can help you find the kind of Fund you might want to invest in. Fund Managers know that you make money when they buy real estate and not when they sell. We know that the art of negotiating the very best deal is where both the developer and the fund is poised for success. This is something we are very good at. We structure investments that impact the Fund’s bottom line, the Developer’s bottom, your bottom line, and our reputation as well. We can even arrange for you to visit projects and meet the developers as part of a Fund’s investment group. This is a way to see the Fund’s opportunities for yourself. Best of all, the developer picks up most of the tab. 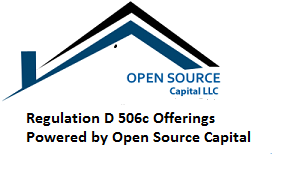 These presentations contain confidential and proprietary information to be used solely for purposes of discussion, to determine preliminary interest in establishing a business relationship with Open Source Capital, LLC and our Sponsor/Developers. Under no circumstances are these presentations to be used or considered as an offer to sell, or a solicitation of an offer to buy any security. Any such offer may only be made pursuant to a prospectus, or other offering documents, meeting the requirement of applicable Federal and State securities laws. The information contained herein is in summary form for convenience of presentation. It is not complete and it should not be relied upon as such.